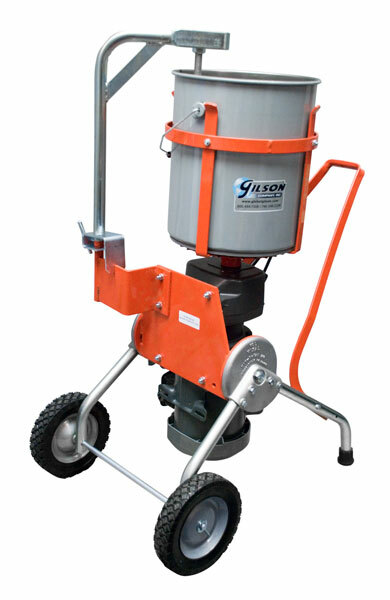 Heavy-Duty Portable Mixers - Gilson Co. Heavy-Duty Portable Mixers are ideal for sample or small batch mixing of concrete, asphalt and cement. Enameled-steel mixers hold a Utility Bucket as it rotates at 60rpm, using a paddle to thoroughly scrape the sides and bottom, ensuring thorough mixing. Mixing Buckets are rugged steel with handles and are epoxy coated for rust resistance. Mixing paddles are ordered separately. Units are equipped with 8in semi-pneumatic wheels for mobility and a constant speed, positive drive gear-head motor that stands up to frequent use and thicker, higher-density materials. MA-67 model uses a 5gal (19L) Utility Bucket. MA-68 uses a 10gal (38L) Utility Bucket.